This topic contains 3 replies, has 1 voice, and was last updated by osify 5 years, 4 months ago. The mobile app that is now in translation into Khmer language. Currently the overall translation reaches 54% since requested by the app author for the next release, one module has been translated 100% (“Strings”). But currently the app will switch language only when set the language via mobile setting so our Khmer language won’t be available for most of the version below Android 4.4 (KitKat). I will see this with the mobile app author. 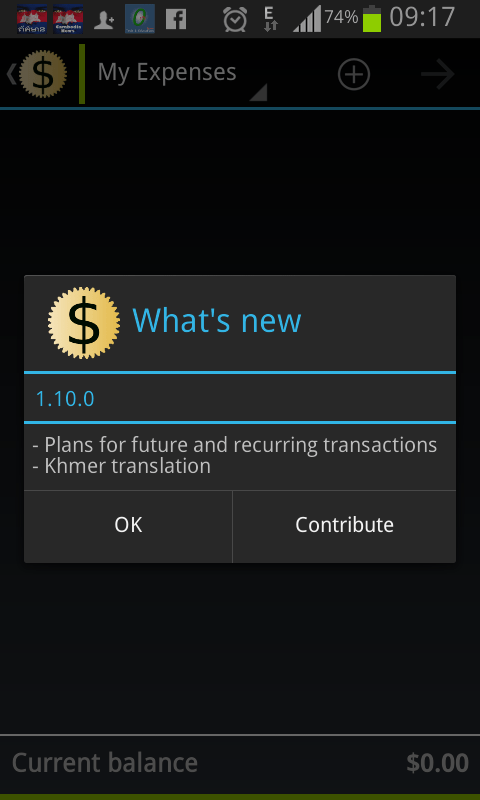 My Expenses version 1.10 released and included Khmer translation. But this version is using system locale and Khmer language is not available yet, I am on discussing with the author of this app to add language switching feature, hope we will have this available for every language as well. Khmer language is now be able to switch via new language switcher in setting which released in version 1.10.1. This reply was modified 5 years, 4 months ago by osify.